French soldiers will be permitted to ‘open fire’ if lives are threatened by Yellow Vest rioters this weekend, the military governor of Paris said today. General Bruno Leray’s ominous words highlight the growing law and order crisis faced by President Emmanuel Macron as he faces up to the increasingly violent social movement. 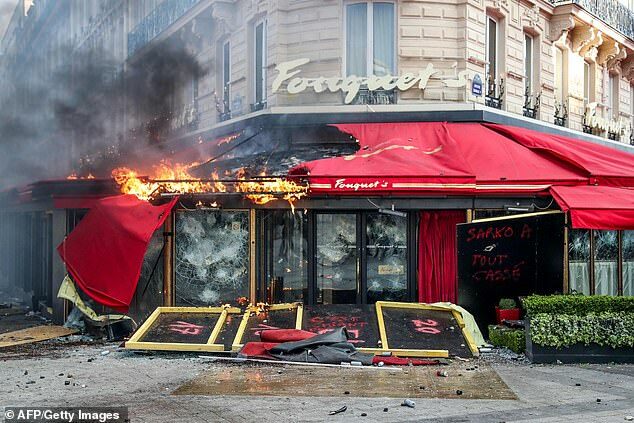 There was widespread rioting across the French capital last Saturday, with banks, high-end shops, and restaurants looted and burnt out. Police took part in running battles with the Yellow Vests, who are named after their high visibility motoring jackets, using teargas, baton charges and water canon to try and restrain them. But despite 250 plus arrests and numerous serious injuries, scenes of anarchy were broadcast all over the world. General Leray said an unspecified number of soldiers mainly used for anti-terrorism duties would be defending public buildings this Saturday. ‘They are subject to the same legal framework as the internal security forces,’ he added, while conceding that soldiers have ‘different ways of coping’ with trouble. ‘They are perfectly capable of appreciating the nature of the threat and answering it in a proportionate manner,’ said General Leray. 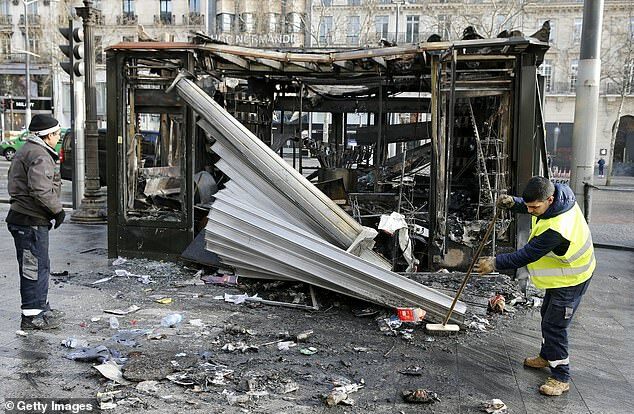 Paris police said today that no Yellow Vest protests would be allowed on the Champs-Elysees tomorrow, a week after hundreds of anti-government demonstrators rioted and looted on the iconic Paris avenue. 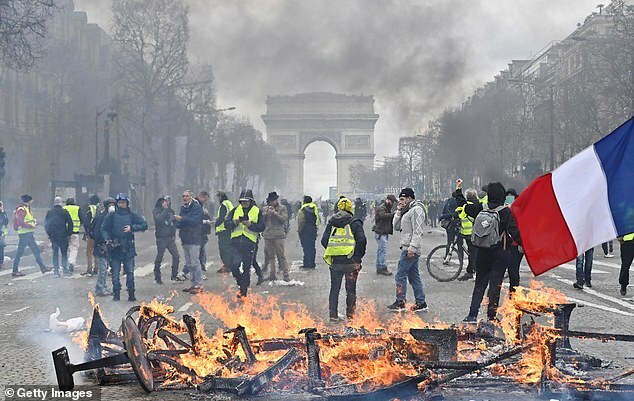 Protesters will also be prevented from streets surrounding the Arc de Triomphe, at the top of the avenue, as well as several nearby areas including the presidential Elysee Palace and the National Assembly, the Paris prefect’s office said. Prime Minister Edouard Philippe also announced plans on Monday to increase fines for taking part in the banned demos. Opponents of Mr Macron’s increasingly reactionary policies have pointed to the dangers of allowing battle-trained soldiers to deal with civilian protests. 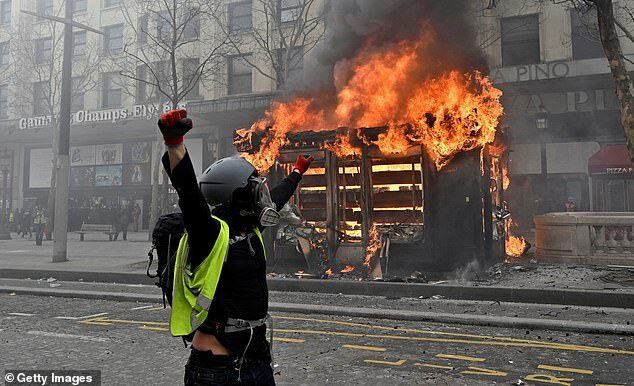 The Yellow Vests began weekly protests across France four months ago, initially because of fuel tax rises. 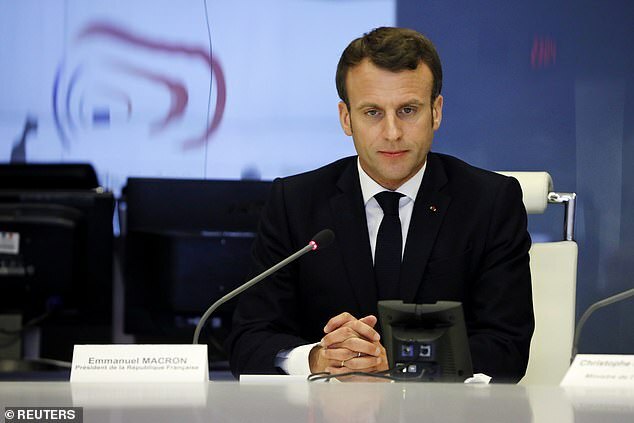 The movement escalated into a broader revolt against the Paris establishment, calling for Mr Macron to resign. French security forces used a ‘last resort’ chemical weapon against them for the first time on Saturday. Gendarmes confirmed that a ‘small amount’ of the gas was released close to the Arc de Triomphe. Video posted online by the independent Taranis news outlet showed the debilitating substance coming out of armoured cars. Police have used a range of controversial weapons so far, from rounds of tear gas to so-called ‘flash ball’ rubber bullets that have caused scores of injuries, especially to eyes.